also called the Athens of Sardinia to describe the lively intellectual activities and the famous people who lived there. A walk in the old town to feel the atmosphere of ancient times when thinkers, writers, politicians, poets and sculptors who enriched the cultural life of the city between 800 and 900. The first stop is at the Museum of popular traditions . 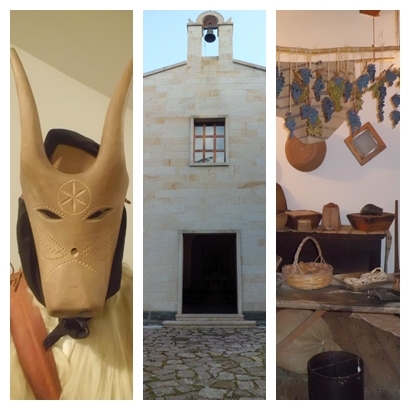 It displays a wide range of local costumes , jewels, masks, objects typical of Sardinian life and handicrafts from different towns, mostly made in the Barbagia area. The tour continues in the house of the famous author: Grazia Deledda, the only italian woman to win the nobel prize for literature, in 1926. Her house is, now, a museum situated in the old town. Here, personal effects, photographs, letters, press cuttings first Italian and foreign editions of her literary writings, and various other memories regarding her life, including a reproduction of her Nobel prize are conserved. Worth visiting Piazza Sebastiano Satta” , designed by Costantino Nivola in 1967. Here, small bronze statues inside small niches carved in stone depict the local poet at different times of his life. The trip would end with a visit to the church of the Solitudine, at the foot of Monte Ortobene where Grazia Deledda ‘s tomb is located.